Fyzix - A Physics Engine for WebOS! My reason for making this and posting it here is so that other people will modify it more and make it run better on the pre. This engine is completely free to use for all purposes, including commercial uses. However, if you modify it you need to post it here so others benefit too! Right now it is a little sluggish on the pre but runs great on the emulator! I would say that it runs better in the emulator then in Firefox or even Chrome. 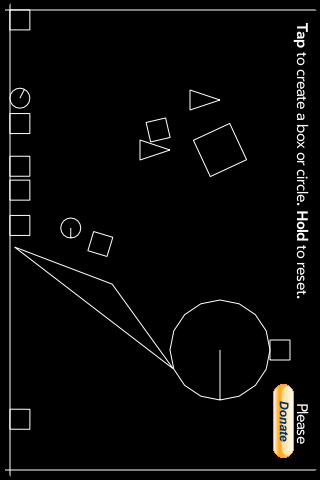 Tap anywhere on the screen and a circle or square will appear. There is extensive documentation of this engine. Simply look at the Flash docs! Also, this is a very robust engine capable of many different uses. You can have multiple gravities, stationary objects, rotating objects, and you can even create your own custom shapes! This engine uses the canvas tag to render all shapes. I am a poor college student. Please donate by clicking here and help me through college!